Summer is here (well, technically just about), the time of year when refreshing cocktails taste best to cool down on a hot day and share with friends. All this week my blog will have a cocktail focus. Tomorrow, I'll review the book Craft Cocktails at Home and share some drinks from and inspired by Kevin Liu's informative book. I'll share some of my favorite cocktail resources. I even have a cocktail-inspired dessert. Plus, there will be lots of recipes throughout the week for classic, contemporary and original drinks. Gin. No drink says "summer" to me more than a Gin & Tonic (or the upscale Spanish version, Gin Tonic). Other summery gin drinks include The Cloister, which includes yellow chartreuse and citrus flavors; self-explanatory Boozy Mint Lemonade; Happy Endings inspired the Whore's Bath (my most popular drink); and the refreshing Spring Breeze with cucumber, mint and lemon. For D.C. locals, you shouldn't let summer go by without having a Rickey, the city's official cocktail. The Nice Rickey by former Washington Post spirits reporter Jason Wilson is one of my favorites. For something spicy, I love the ginger-peppercorn kick of Kickin' Cucumber Collins. Aperol. Of the many Italian aperitifs that have been popular lately, Aperol is my favorite. It's most classic cocktail is the Spritz, made with prosecco and orange juice. For a summer barbecue, I recommend the smoky-spicy Light My Fire made with mezcal and jalapeño. For something evocative of a summer sunset, try the August Sunset made with gin, St. Germain and lemon. Or mix it with gin, dry vermouth and lemon in Everybody Loves a Gin Blossom. Tequila and mezcal. Is there a spirit more closely associated (sadly, sometimes badly) with summer parties? Tequila and its smoky cousin mezcal shine during the warm season. Go simple and crowd-pleasing with a Classic Margarita (fresh ingredients really elevate a margarita above your low-brow cantina version). For an interesting twist, try a Ginger Margarita. For a marg with some kick, I suggest the Margarita on Fire with mezcal and habanero shrub. Tequila isn't just for margaritas either, and makes an interesting partner to scotch in the Tartan Mula and absinthe and ginger beer in The Silver Linings Playbook. For mezcal lovers, I recommend two of my Dallas Drinks: the tart and refreshing Elena and the spicy bourbon drink, The John Ross. There's also the Smoky Ginger Cocktail with ginger beer. Mint. My favorite herb is perfect for cocktails with a cool, refreshing quality. Fresh berries flavor Blackberry Mint Fizz, while ginger and jalapeño give Spicy Ginger-Mint Fizz its kick. A classic Mint Julep is a great choices, or my fiery irreverent version inspired by the recent hit film, the Django Unchained. Or for something all-around refreshing, try the Spring in a Glass (made with gin and fennel liqueur). Need more suggestions? 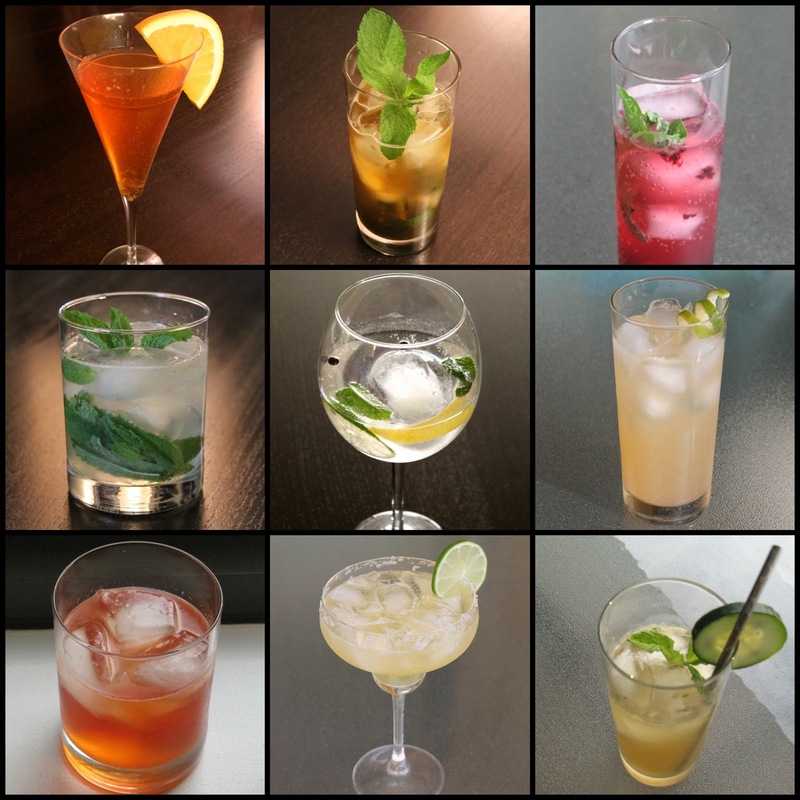 Check out the cocktail index (which I just updated) with links to all my cocktail recipes organized by spirits, flavors and other themes. Wow. We've had a lot of difference cocktails since you began blogging, haven't we? Yes! An average of 1 of week, which puts us...well, up quite a bit. This is really only a sample.